Property Details: 1 Bedroom, 1 Bathroom Oceanfront Property, Sleeps 6. The Breakers condo, beachfront residence home in Hilton Head South Carolina with direct oceanfront views from the third floor – this condominium home was completely remodeled in 2013 and has tile flooring throughout, HDTV’s in living room and bedroom fans in living area and bedroom, modern kitchen cabinets and appliances (please be aware that there is not a full oven in the kitchen however does have a counter top oven) , granite countertops, washer/dryer and so much more. 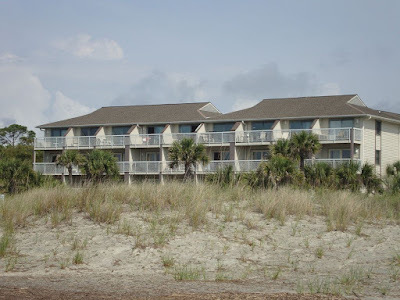 Exceptional ocean views from the private balcony and living room to enjoy the sunrise, dolphins, views of Tybee island and beach. Top floor unit that provides unobstructed views of the sky and stars without the worries of noise coming from a unit above. You will not want to leave your deck! This unit is great for small families as well as 1 or 2 couples with a maximum occupancy of 4 adults (ages 18 and over) If you love relaxing on an ocean front deck, lying on the beach which is just steps away, lounging in or around a beautiful pool or taking in the many sites of Coligny Plaza, then this is the unit for you!.. Hilton Head South Carolina is one of America’s favorite island destinations, with 12 miles of pristine beaches and everything you need for a great beach vacation. Visitors to Hilton Head Island can enjoy slow days relaxing in the sun, sand and surf on some of the best beaches anywhere. Long known as a golfer’s paradise, Hilton Head Island is ideal for outdoor sports enthusiast – including tennis, volleyball, polo, championship golf on some of the best courses available. Hilton Head is host to many prestigious sporting events throughout the year. In between games or matches, explore Hilton Head’s natural wonders like the Sea Pines Forest Preserve, a close-up look at a swamp, with access via boardwalk path for pedestrians. And don’t miss the colorful Harbourtown Lighthouse, the island’s icon. The post The Breakers Condo, Hilton Head Vacation Rental appeared first on Carolina Beaches. The post The Breakers Condo, Hilton Head Vacation Rental appeared first on USBeaches.net.